YANovCon 2019 is right around the corner, and we’re hosting another Short Story Contest. Submit your storyopens a new window by Monday, January 14, 2019, and you could win a one-on-one lunch with a published YA author. Craft an original short story that involves at least one main character who wants to share a secret, problem, or surprise about something in their home. Maybe they're scared to admit that they're unhoused; maybe they're treated differently from their siblings; maybe they're dealing with parental abuse, or a family member has substance abuse issues. Consider researching about teens experiencing trauma in their lives and the ways they deal with them to incorporate in your story. What is your understanding of that issue? 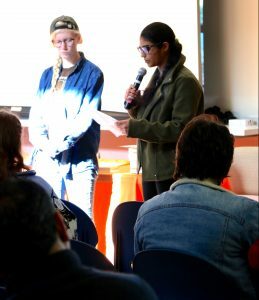 Amrita reading story at YANovCon 2018. I breathed in the scent of red pepper and melted cheese. It was a scent I had smelled many times, but somehow in New York, it was different. The bell above the door rang, and another customer entered the pizza place in search of a slice. I smiled at my family, our mouths full of the delectable pizza. A girl and her mother dined next to us, laughing together. A man entered the restaurant, scanned the room and ambled over to my dad. He was a tall African American. Judging from his ragged clothes, the man appeared to be homeless. A bottle of alcohol peeked out of his sweatshirt pocket. He glared at us, and when he opened his mouth, the words coming out were crude and insulting. He had seen the turbans my brother and my dad wore and assumed we were Muslims. The words he said made me feel horrible, and I could feel the tears slipping down my cheeks. The whole restaurant was silent, and everyone was staring awkwardly. The man was screaming now, and the words were spewing out of his mouth, a whirlwind of hate and animosity. “You Arabs,” He spat in disgust. “My people have been here for hundreds of years. We were beaten and enslaved. You Muslims take our jobs and earn enough money to travel, while we are poor and suffering.” The man’s hands shook as he gripped the bottle tightly. In that moment, all I wanted to do was go home. I didn’t want to be a Sikh. It was not the first time that something like this had occurred or that we had been mistaken for Muslims. I felt like all of America was against us. People were just watching the altercation, and nobody was doing anything. They were probably glad they weren’t in our position. The blond girl close to us was crying by now. She looked to be in her early twenties, and she was sobbing hysterically. “I support black lives matter.” She whimpered. I instantly felt annoyed. The girl had probably never experienced hate before because of her religion or ethnicity, yet she was distressed. I didn’t know why I felt upset with the girl, but something inside me burned with a deep and unexplainable emotion. I didn’t realize until the police burst in that the owner had called for help. In a matter of seconds, the man was escorted out. But, the damage had been done. As my anger ebbed, I felt a surprising sense of sympathy for the man. I thought about how he probably hadn’t had the same opportunities growing up as I did. As I glanced around the restaurant, I saw a sense a relief on the faces of the diners. An unpleasant moment had passed and normal life could resume. But unsettled questions still hung in the air. Was there fairness? Was there justice? Could we all see each other in the light of compassion?